This article is part of a series of Women’s Makeup Through the Years that I’ve put together. It should be noted that I’m no expert on this subject. My research is coupled with information from the Internet, and some reference books. I have cited sources wherever possible. This is my own personal take on the subject, and by no means comprehensive. Any errors are my own. Decoration of bodies, for both men and women, has been going on since ancient times. Whether for religious reasons, to indicate tribal loyalty, or simply to make themselves appear more attractive, human beings have always wanted to beautify their appearance. 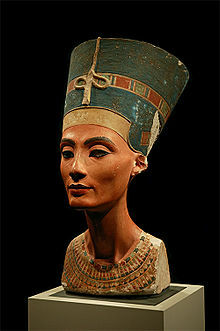 It was ancient Egypt, however, that laid the foundations of cosmetics application as we know it today. This civilization used makeup, both to enhance their beauty and for health benefits, and scent to mask body odour. The principal colours used were green and black: green malachite for eye shadow and lead sulphide (kohl) used for eyeliner. Thick eyeliner was not only decorative or preventing glare from the sun, but it had chemical properties used in eye medications, and kept flies from the Nile’s marsh at bay. Cosmetics were so important that many Egyptians went to their tombs fully made up. It was very important to have a good appearance in the afterlife. Archaeologists have also found makeup kits in their tombs. The wealthy women of Rome highly valued pure white skin. Since this did not come about naturally, they required whitening makeup, such as chalk or white lead. They were able to afford “cosmetae”, female slaves who applied their mistresses’ makeup in private rooms (does this remind anyone of modern day salons with estheticians?). 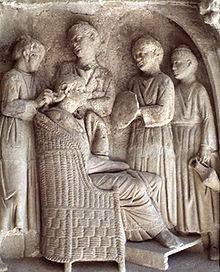 Cosmetics were very expensive, often coming from Germany and Gaul (France), only affordable by these women. Other commonly used ingredients were carmine for the cheeks and ash and powdered saffron for the eyes. Working-class women had to make do with “designer brand” knockoffs. Scent was also very important. Because of stench of some of the ingredients in their makeup, women would almost bathe themselves in perfume. The advent of Christianity gave the taint of immorality to women’s cosmetics. Makeup was condemned as “ungodly” or “unchaste” for women. St. Cyprian, referring to application of cosmetics, wrote “everything that comes into existence is the work of God; what is changed is the work of the devil”. 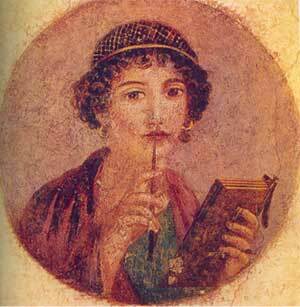 Roman women were strongly advised to shun cosmetics. As we have seen in Rome, a white complexion was highly prized, and this trend spread to the Mediterranean world. Greek women had darker skin that required whitening. A paste made of white lead was applied to the face, neck and shoulders to achieve this appearance, and to lessen the look of wrinkles. Although lead sulphide was known to be highly toxic, women continued to use it. Cosmetics were often imported from Egypt. Others products were used to enhance lip and cheek colour (flowers or crushed mulberries), and soot was used in eye shadow and eye liner. 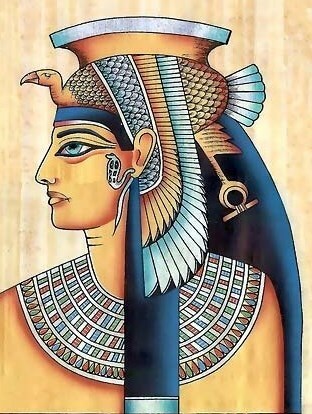 Greek women also loved to use perfumes, which were imported from Egypt. Books: Cosmetics and collectibles: beauty from Victorian times to the present day, by Madeleine Marsh, Pen & Sword Books Ltd., 2009.